There is nothing more enticing than warm, fresh-from-the-oven bread. It’s just so simple. And delicious. A few months ago, my mom made some homemade French bread, which although scrumptious, I immediately started thinking about how to embellish. So when I was home last time, we decided to get a little creative. The recipe my mom uses is a simple food-processor recipe much like this. For the garlic, we roasted 4 cloves, still in their paper, coated in olive oil and wrapped in foil at 400 for 30 minutes. Once they’ve been roasted they just slide out of the paper. We chopped up two sprigs of fresh rosemary and chopped the garlic too, (which is a little tricky because it’s sticky). We added the rosemary and garlic to the dough while kneading it, although I think we could have added it in the food processor stages. The hardest part about this recipe is the time it takes for everything to to proof and rise and bake, but the end result is totally worth it. This bread was so yummy! 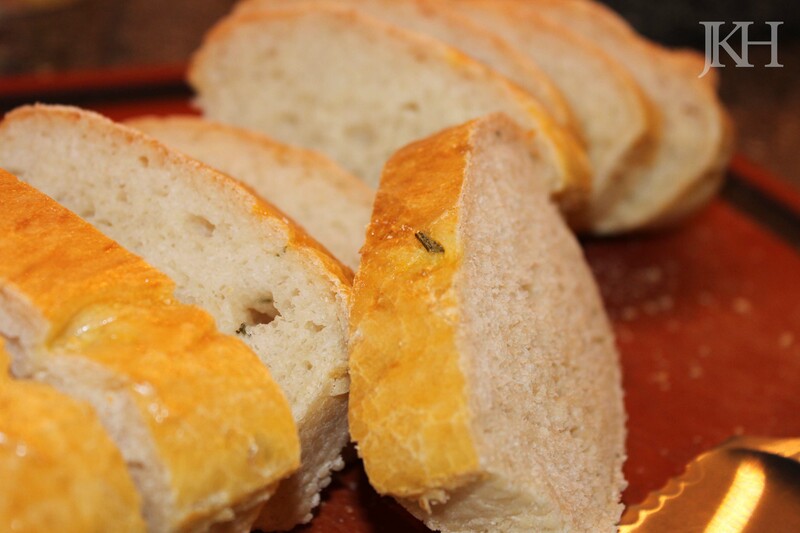 The recipe we used yields two loaves, so next time I would add more rosemary and garlic to enhance the flavor. I used the leftovers the next day for a grilled cheese and added a little fresh rosemary inside. Homemade bread is a really exciting thing to make.